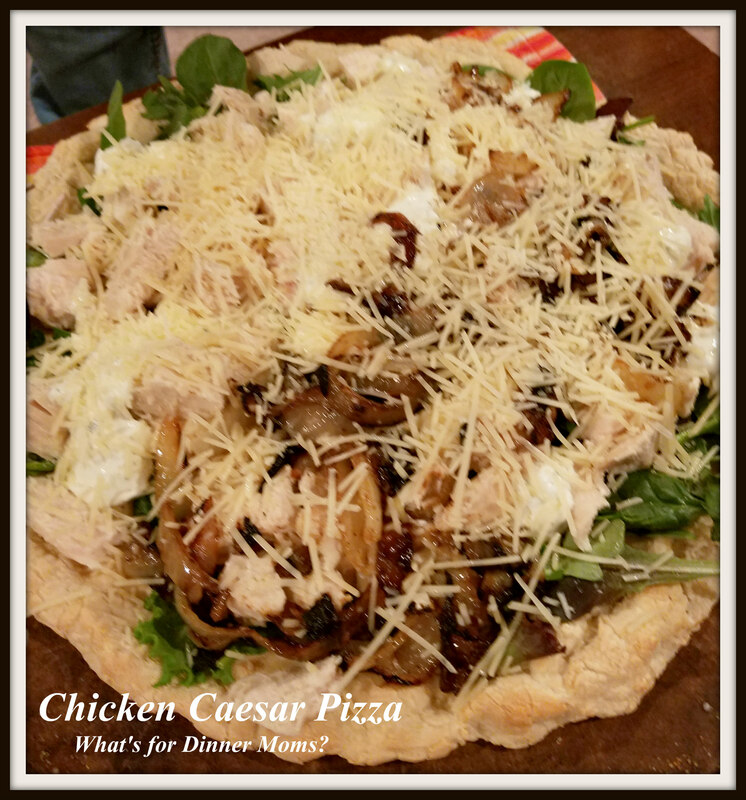 Chicken Caesar Salad Pizza – What's for Dinner Moms? Not a great picture but this was a yummy pizza. This pizza was created because we had chicken to use up and I am always trying to find new ways to make the dishes we love in new ways. One of my favorite things is to take a meal we love and turn it into something new such as sandwiches into soups, casseroles into pizzas, or soups into sandwiches. 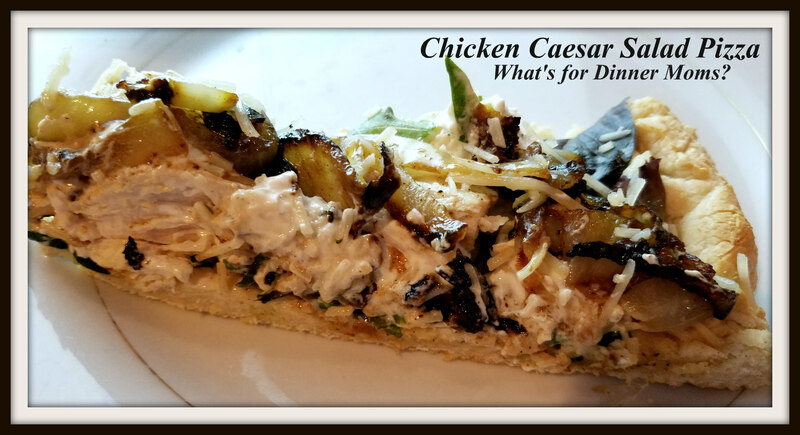 We had the makings of a Caesar Salad but wanted something different. What is different? Making it into a pizza with caramelized onions! This was so good. It was having bread and salad at the same time! This is great way to use up leftover chicken breasts. Caramelized onions are one of my most favorite foods and I love adding them to anything I can. Remember they take time to make but are so easy. The hardest part is let them cook super slowly to let the sugars caramelize rather than turn up the heat and brown them. If you don’t care for onions leave them off but they are so good! All the ingredients listed below do not have measurements because it is up to you. Like a lot of cheese? Put extra on. Like only a little bit of salad dressing? Only put a little bit on. It is all up to you. 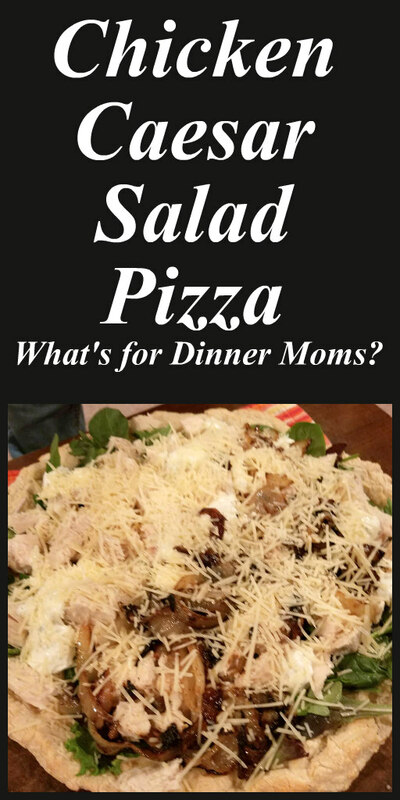 Pizza and salad all in one! Caramelize onions by slowly cooking them in 2 tablespoons of butter over medium-low heat. They will take about 30-40 minutes to cook. Once onions are cooked form pizza dough into a large circle and cook on a pizza stone or pan according to package directions. Remove dough from oven and allow to cool for 5 -10 minutes before preparing pizza. While dough is cooking mix salad greens with salad dressing and a bit of Parmesan cheese. Warm chicken slightly in microwave. To prepare pizza place greens on top of dough, top with chicken, caramelized onions and a sprinkling of Parmesan cheese. Drizzle with a bit of extra dressing if desired. Top with freshly ground black pepper. That’s a good idea to make pizza from leftovers. Thank you. I try to use up everything! And your creativity benefits from it!